The Capability Restaurant has an eye-catching and mouth-watering menu, where food is sourced as locally as possible with fish coming out of Syon Lake straight to the on-site smokery. 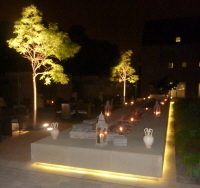 Herbs are grown adjacent to the Terrace, with fruit and vegetables not being much further away. The hotel itself is a new build, and as such is not inspiring on first sight, contrasting with the genteel location of Syon Park. The main entrance and reception are a mish-mash of spaces that do not impress. The wow factor starts with Peacock Alley, the semi-circular beautifully lit Martini bar that is a centre-piece in praise of alcohol.We started off our evening with a cocktail each. My companion for the evening had a Vodka martini and I had one with Gin. I asked for the driest gin they had and it was rather perfectly dry, although I'm glad I didn't see the price tag before ordering. Martinis were offered with or without ice and either with an olive or a twist. 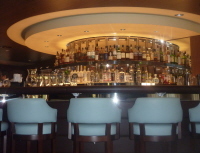 There were over a dozen vodkas or gins to select from so all tastes are catered for. Cocktails were accompanied by a generous selection of olives and slightly spicy lightly crunchy nuts. The cocktail menu is extensive at 28 pages and worth a read just for the pleasure taken in making the selections. We were moved into the Capability Restaurant and introduced to our waiter for the evening. Starters range from £6.75 to £14.50. I had the cheapest and my companion the most expensive. Robert's edible garden summer salad was a mixture of peas, broad beans, white beetroot, giant celery and various other tastes out of the garden, with a delicious piquant dressing full of fresh mint that lifted the salad to another level. This was all topped by edible flowers making a beautiful presentation. We had delicious sour-dough bread and butter as an accompaniment which we could have munched away on. 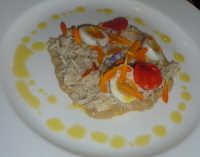 As for the spider crab salad with quail eggs and mayonnaise, it tasted, well it tasted very crabby. We could not think up another way of describing a dish that tasted so much of crab. There was just enough mayonnaise to add to the taste and texture without detracting from the crab. We were also offered a taste of the smoked salmon with shaved fennel salad. It's very gently smoked, tasting both of salmon and of smoke rather than the one masking the former. I didn't like the accompanying salad but as I don't like fennel that's down to me. Onto the main courses we both decided against the 28 day aged beef although very tempted. I went for the Braised Yorkshire rabbit with spicy wild boar sausage and my guest had the char-grilled Jimmy Butler's pork cutlet with shaved fennel and asparagus. There was a selection of other meaty main courses and half a dozen fish dishes so certainly something for everyone although if you are a non-fish eating vegetarian you would struggle. We had garlic spinach and chips to accompany our main courses. It is at this point that I must admit we were so pleased to tuck in to our meals that we forgot to take photos. I do apologise but they did look good. The rabbit was cooked in a very rich leeky sauce (halfway between thick and thin), enhancing the rabbit which was moist but not quite falling off the bone. These delicate tastes were quite strongly contrasted by the small mouthfuls of sausage with oodles of taste.The pork was also nicely moist and flavoursome, quite simply presented. The spinach tasted of spinach and garlic, and after a mouthful no-one who hadn't partaken would have wanted to kiss you back but it was lovely. So often people are stingy with garlic. The chips on the other hand were a disgrace: soggy, tasteless, no flavour and no crispiness. We both felt that side dishes could have been included with the main course rather than being an optional extra. The pork dish looked a bit bare. There are six desserts on offer (£6.50-£8.75) as well as a cheese board. 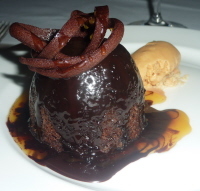 I had the Amedei chocolate pudding with caramel and sea salt which was a small but concentrated cakey pudding with chocolate sauce and caramel drizzled on top with a nice dollop of caramel on the side. If you haven't had sea salt with chocolate caramel before it's another example of contrasting tastes that heighten the chocolateness. 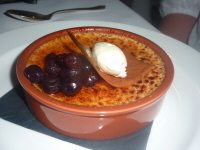 Trinity burnt cream is the British version of creme brulee, that's rich, creamy and slightly less sweet, but nicely caramelized on top with Dorset blackberries. Simple, but beautiful and the dish was scrubbed clean. We were brought our coffees outside on the terrace, where discreet heaters stopped us from getting cold and we lounged on deep sofas with coffee that was accompanied by a couple of chocolates each and a generous digestif. We had, on our waiter's recommendation a glass of 2010 Johnson Estate Marlborough Sauvignon Blanc, followed by a 2008 Fleurie Domaine des Deux Fontaines. Glasses of wine start at £7 each and move steadily upwards. The wine menu is varied at both ends of the price range with full bottles starting at £24. Both our glasses were good, with the Sauvignon being a particular fine example. They were also both perfectly described. The one real criticism is that while the staff were very attentive they moved us through the meal at a pace. Barely a couple of minutes passed between each course which for me is not enough to give my taste buds a pause, talk a bit more, relax and enjoy the atmosphere. I would have quite happily finished my cocktail before sitting down to eat. Having said that, once we were outside with our coffees, we then sat there for a good hour or so before leaving. Our meal cost just over £40 each and we drank at least that amount in cocktails, two glasses of wine each and a digestif so the full experience would be close to £100 each. With only a single glass of wine the meal could be kept to £50 a head but it would be restrictive, and let's face it, it's no fun going to a restaurant feeling that half the menu is outside your price range. The restaurant itself as a venue is nice, but nothing special. 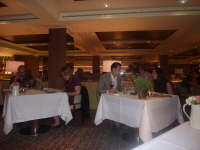 The staff were charming, friendly and polite and the food and drink excellent. Whether it's worth the cost I'll leave to you.